Heat pumps are devices that use small amounts of energy to move heat around. They are used most commonly to draw heat from the air or water, to heat a building like your office or home, but it can also be used to cool down a building. They are designed to move thermal energy in the opposite direction of natural heat flow. Heat pumps allow heat to travel from a lower to a higher level of temperature. This pump consists of a closed circuit which a refrigerant flows through. Inside a heat pump you will find a compressor, an absorber, a condenser, an expansion valve and an evaporator. Together, they create a cycle in which the compressor supplies the refrigerant with energy; the refrigerant absorbs the heat inside the evaporator, which in turns flows through the condenser, creating heat. Generally speaking, there are two types of heat pumps: ‘air to air’ heat pumps and ‘air to water’ heat pumps. Air to air heat pumps: These heat pumps extract air from outside and transfer this heat to inside air. These are also the most used and cheapest heat pumps on the market. 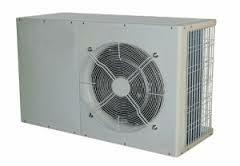 They are very similar to air conditioners and work almost on the exact same principal, by using outside air. Air to water heat pumps: These pumps transfer the heat that was extracted into a circuit or a domestic hot water tank like a geyser, which can be used for showers or hot water taps. The advantage of using a system like a heat pump, comes from its ability to supply more energy, at a much lower cost, as it draws from air or water. According to Eskom, household geysers use 3 units of electrical energy to produce 3 units of heat energy, where a heat pump converts just one unit of electrical energy into three units of heat energy. We are 24 hour plumbers, ready to assist you with a heat pump installation, simply give us a call!